We recently wrote about the many attractions at Baltimore’s Inner Harbor, and we mentioned that the historic ships docked there are one of them. Baltimore’s Inner Harbor draws visitors and locals with beautiful views, museums, restaurants and shopping, and to see the historic ships docked here. The USS Constellation Baltimore is one of the crown jewels in the Inner Harbor. Marrying past and present, the USS Constellation is a time machine into American history while still contributing to Baltimore’s story today. Baltimore’s USS Constellation is more than just a showpiece, though. Tours and onboard events keep it relevant, while reminding and educating visitors of our nation’s history. When you visit the USS Constellation Baltimore Museum, you should start with a stop: that is, a stop into Pier 1’s Museum Gallery. The Constellation’s history is told through accumulated artifacts and personal effects that belonged to the ship’s crew. And to make the most of your time aboard, you can pick up a complimentary audio tour wand in the Museum Gallery that’ll inform you about the ship and life aboard as you walk through. Uniformed crewmembers aboard the Constellation can answer questions and provide that authentic ambience. The Constellation’s four decks offer different attractions in this Baltimore Harbor mainstay. The top spar deck is where the sailing happened. The deck underneath, the gun deck, housed the armory, the galley, and the Captain’s Cabin. Below that is the berth deck, the heart of life on board for the crew. The lowest deck is the ship’s hold, where food, water, and gear were stored. The first Constellation was a frigate designed by naval constructors and built right in Baltimore at the Sterrett Shipyard, completed in 1797. The first Constellation sailed to the West Indies, the Caribbean and engaged in multiple battles against French privateers. After many adventures, with victories and mishaps peppering her story, including a circumnavigation of the globe, the first Constellation was broken up in Norfolk in 1853. The second Constellation was a sloop commissioned from Norfolk in 1855. …And thus, the story of the USS Constellation begins. Where did she go? What did she see? And how did she end up back in Baltimore? Go aboard, and find out! 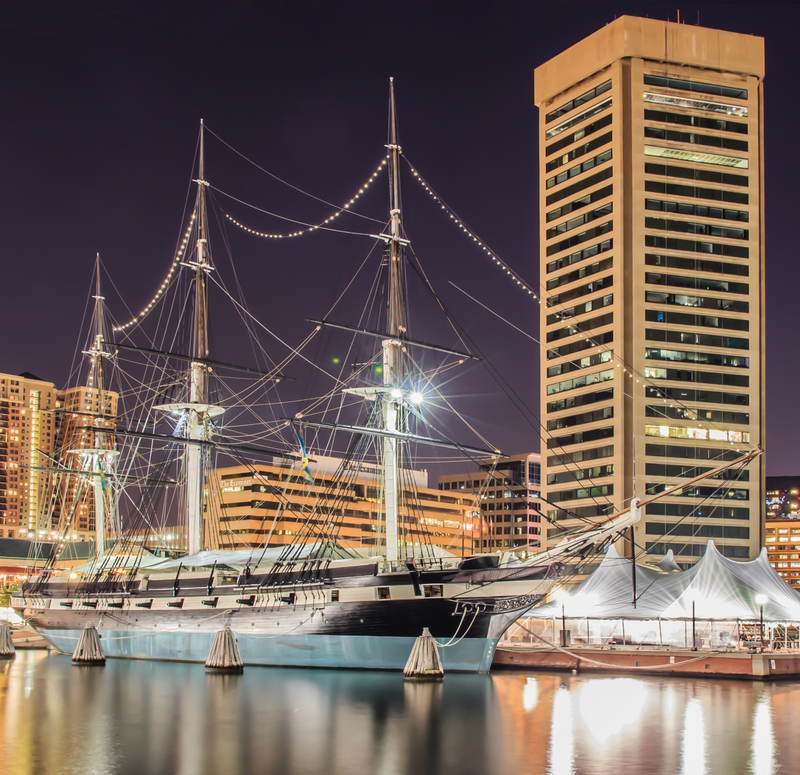 A number of special events still take place throughout the year in Baltimore aboard the Constellation. In just a few days, for instance! A seated four-course dinner with wine pairings in support of preserving and restoring our maritime heritage. Proceeds from the Jubilee support hands-on educational and interpretive programming, and the ongoing restoration and preservation of the fleet, including USS Constellation’s rigging repairs. After the race, join the revelry under the big tent on Pier 1! More details coming this summer! Sip champagne and watch the fireworks from the deck, high above the Inner Harbor crowds. An all-inclusive gourmet menu, providing appetizers and desserts, will be served with local ale, wine, mulled cider and coffee. There will be noisemakers, party hats, special tours and cannon firing demonstrations all night! We hope you’ll pick the Wayside Inn for your next Baltimore trip. Our historic inn is located in Ellicott City, just a short drive from the city. Check out our free area vacation guide to help plan your stay.